It’s a small story in a medium-sized city about a large problem. 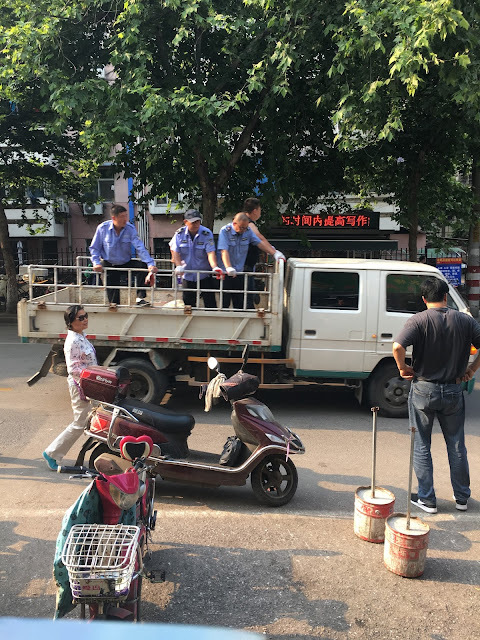 During the recent Dragon Boat Festival in Nanjing, the city management bureau [市城管局], checking to see how traffic was flowing, came across unauthorized fee collectors [停车收费员]—people charging drivers for parking their cars in spots that either should have been free, or where they had no right to pose as city agents to collect money. According to the brief account rendered in Nanjing Daily [南京日报], 32 people were cited and charged, 3 were arrested, and more than 50 received warnings and told to move along or else. “Like all kinds of irregularities, the purpose was to put the parking fee into their own pockets,” Deputy Director Lin Fujian [林福建] of Nanjing’s Parking Facilities Management Center [市停车设施管理中心] summarized. Indeed; and like all kinds of social conduct in China, it’s another tale of people behaving badly. It’s also about what local officials do about such behaviour. There’s been a lot made of the recent anniversary of a case of political rebellion, and how many in contemporary China are casting it years later as something necessary to maintain order. That was a seminal event, to be sure. But what matters on a daily level here to officials and citizens in Local China far more are the individual, barely organized challenges to authority generally. In China, efforts to loot are about ambition--and more generally, the seeking of advantage in small ways that are defiant of rules and regulations, laws and social strictures governments have put into place. Any and every resident of Local China sees disobedience on display here daily. The people who cut in line or decide in smoke in spaces that prohibit it; the vendors who manipulate weighing scales and sell produce and other products they know to be tainted; the individuals who grab public goods and common land for private use; the drivers who switch lanes and license plates with abandon; the touts and tour guides who offer a back way into parks and places of historical interest—this is a class of people without class [素质] when it comes to conduct. Not everyone here acts that way; but enough do for local governments to spend a lot of time and energy wondering what to do about it. Some officials want to continue to emphasize the importance of civilizing citizenry. Education, persuasion, social pressure—those are all strategies already in place that are supposed to hold people accountable to do the right thing, as defined by the State. Others think campaigns [运动] against criminal (or even unethical social) behaviour are the best approach—that you can’t stop uncouth conduct, but you can contain it by strict enforcement. Whatever the approach—and some local governments tend to pursue both simultaneously—it's not protests they practice for, but identifying problems. Local officials do not see incivility or rent-seeking as a sign of subversion or authority disintegrating, but a symptom of a society requiring better guidance and stricter supervision. These days, the focus is on a more comprehensive practice of social governance, playing better offence instead of defence, problem-solving the street. Efforts at better management don’t mean local government is desperately trying to keep society stable: That’s a canard. There are all sorts of ways to accomplish that objective simply by becoming more draconian. Chinese officials tend to reserve their batons for specific groups they see as especially troublesome--religious cults, weiquan [威权] lawyers, and the like—that is, power that’s trying to be organized as an alternate authority but ends up failing because the State is too savvy and too strong. Some here may admire their struggle, but few ignore the scarceness of their success. The real struggle isn’t State versus Society—and both practitioners and observers who act and think otherwise are mistaken. The battle is within the Party and the government, especially at the local level: Between those officials who want to increase the level of pressure on wrongdoers in society, and those cadres who think the only way to civilize is to be civilized in the effort. The objective though is the same: Stopping those who are trying to take advantage, who look to become their own local authority at the expense of the State—as in the parking fee collectors caught by the city because some officials went out looking for trouble and squelched it. The offenders didn’t want to overthrow the government, just undercut it. That may seem like another small story, and compared to the social rebellions of nearly 30 years ago, it is. But the larger tales and longer trajectory of Local China will come to depend on who decides how uncivil behaviour gets dealt with locally. Which reminds me...as soon as you have enough experience/data, how about a post on the Social Credit program? Thanks very much. Right now, there seems to be no one social credit policy but a whole host of them. There are experiments ongoing, sometimes with different scenarios in the same province (Jiangsu being one of these). Thus far, there are proposals, but not a policy per se; that's still coming together, or evolving at least. I'm not aware of any country granting visa-free travel to Chinese citizens based on social credit scores here, but this may be news of which I'm simply not aware.